Nothing interrupts a pleasant evening quite like a mosquito buzzing around your ear. Mosquitoes are certainly annoying, and their bite can be aggravating, but they can also be dangerous to the health of you and your family. Mosquitoes can bring illnesses to your home, including the West Nile Virus, and the increasingly alarming Zika Virus. 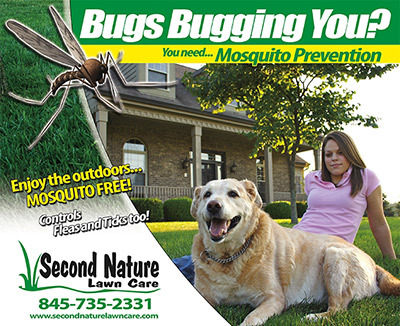 Second Nature Lawn Care can help you reduce mosquitoes on your property this year. Unlike other mosquito control services, we apply a barrier spray to your entire property in order to repel mosquitoes now and in the future. We treat for mosquitoes at regular intervals to ensure an insect free yard throughout the entire Summer season, as well as we offer mosquito treatment applications before special events. Whether you have an upcoming BBQ, outdoor wedding, or graduation party, let Second Nature Lawn Care be your first call for mosquito control. Wondering if we provide our best in class mosquito control services to your neighborhood? If you’re town or city is found in our service area list, we look forward to serving you!